Let’s embark on a tour between Heaven and Earth, between the past and the future – to Mount Olive of the Jewish, Christian, and Muslim traditions. 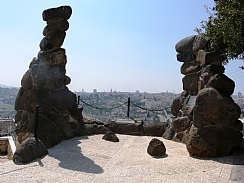 <?xml:namespace prefix = st1 ns = "urn:schemas-microsoft-com:office:smarttags" />Mount Olive overlooks Jerusalem from the east, revealing a breathtaking view of the city in its full glory. This is the place where everyone – Jews, Christians, and Muslims – awaits the coming of the messiah and the end of days. Throughout history Mount Olive has been linked to the three religions through stories of redemption and the end of days. The Jews marked it as a cemetery of eternal life, the Christians built important churches here that mark the last days of Jesus, and the Muslims built mosques and houses of prayer on the mountaintop. We will trace the tracks of these traditions and try to sense some of the sacredness of this special place. We will hear about poets who dreamt of Jerusalem, about Russian princesses who fell in love with the city, about the tombs of prophets and righteous men, about a scapegoat, about rising to Heaven, and about the longing for redemption. The sites of the tour include the Mosque of the Ascension, Rehavam Overlook, the Tombs of the Prophets, Dominos Flevit, Yad Avshalom, and the Tomb of Benei Hezir.